China New Borun Corporation (NYSE: BORN), a leading producer of corn-based edible alcohol in China, recently reported the results of its annual meeting where three directors were re-elected, two new directors were elected, and the company’s auditor, BDO China Shu Lun Pan CPA LLP, was reappointed. The re-election of Mr. Hengxiu Song, Mr. Jinmiao Wang , and Mr. Binbin Jiang , as directors of the Company, to hold office until the close of the next annual general meeting. The election of Mr. Wen Jiang and Mr. Xisheng Lu, as directors of the Company, to hold office until the close of the next annual general meeting. The re-appointment of BDO China Shu Lun Pan Certified Public Accountants LLP as the independent auditor for the Company for the fiscal year ending December 31, 2012. China New Borun Corporation (NYSE: BORN) is a leading producer and distributor of corn-based edible alcohol in China. Borun’s edible alcohol products are primarily sold as an ingredient to producers of baijiu, a popular grain-based alcoholic beverage that is sold throughout China in retail stores, restaurants and bars. The Company also produces DDGS Feed, liquid carbon dioxide and crude corn oil as by-products of edible alcohol production. China New Borun is based in Shouguang, Shandong Province. Additional information about the company can be found at http://www.chinanewborun.com and in documents filed with the U.S. Securities and Exchange Commission (“SEC”), which are available on the SEC’s website at www.sec.gov. Changfeng Engergy Inc. (TSXV: CFY), a natural gas utility in China, recently announced that it completed key safety and inspection testing of its Xiangdong pipelined gas distribution project. To date, some 7.5km of pipeline has been buried underground, setting the stage for potential upside when it comes operational on a commercial level. Changfeng Energy Inc. (“Changfeng” or the “Company”) (TSX VENTURE:CFY), a natural gas utility in China, announced today that the Company has completed the preoperational inspection and safety testing of its Xiangdong pipelined gas distribution project (the “Xiangdong Project”) located in the Xiangdong district, Pingxiang city, Jiangxi Province, China. As a result, the pipeline and its facilities are ready for the commercial natural gas distribution. The Xiangdong Project, the Company’s first pipelined gas distribution project in Mainland China, was launched in early 2010 and the first phase of construction of this project inside the Pingxiang Industrial Ceramic Park (the “Park”) commenced in November 2011. To date, approximately 7.5 kilometers (4.66 miles) of pipeline has been buried underground, and a set of CNG (compressed natural gas) pressure regulators and gas processing facilities were installed. 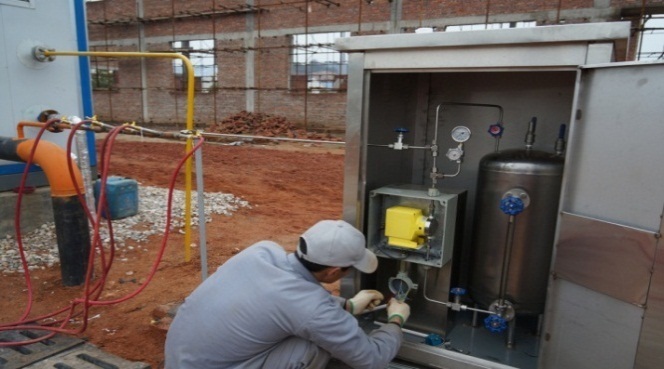 To view “Figure 1: An on-site technician is checking the pressure regulator“, please visit the following link: http://www.marketwire.com/library/20130122-848596800.jpg. 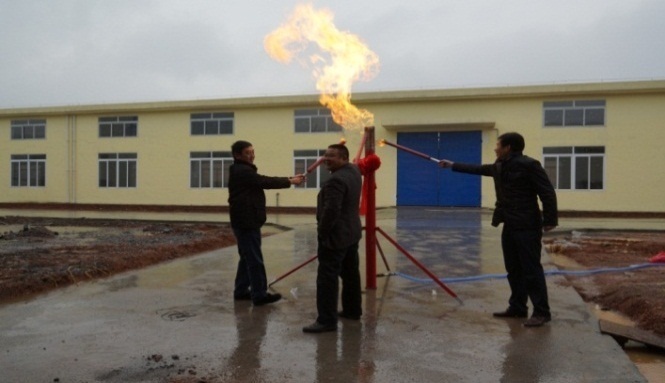 To view “Figure 2: From left to right, representatives from Changfeng, the local customer, and the local government participated in igniting the gas for safety testing in the Park“, please visit the following link: http://www.marketwire.com/library/20130122-800848596.jpg. Changfeng Energy Inc., is a local natural gas distribution company (“LDC” or natural gas utility) with operations located throughout the southern part of People’s Republic of China. The Company serves industrial, commercial and residential customers, providing them with natural gas for heating purposes and fuel for transportation. The Company has developed a significant natural gas pipeline network as well as urban gas delivery networks, stations, substations and gas pressure regulating stations in Sanya City & Haitang Bay. Through its network of pipelines, the Company provides safe and reliable delivery of natural gas to both homes and businesses. The Company is headquartered in Toronto, Ontario and its shares trade on the Toronto Venture Exchange under the trading symbol “CFY”. For more information, please visit the Company website atwww.changfengenergy.com.